Much is said about special substrate, attention to fertilizers, and water conditions to grow healthy green plants. The fact is, with simple lighting and the right choice in easy-to-grow plants known for high oxygenation, every community can have great live plants without much trouble at all. If your intention is to grow exotic rare species of plants, it’s quite another story, but with common aquarium​ growth-oriented plants described in this article, no special expertise is required. In general, if an aquarium is near a sunny window, it may only need 5 hours of artificial light per day. But in direct sunlight, the algae growth will be out of control, even without any artificial light at all. For best results, an aquarium should be placed in an area where sunlight never reaches it directly. Artificial lighting should be on for a minimum of 8 hours per day but can stay on 10 to 12 hours if this enables better viewing in the evening for the hobbyist. Incandescent lighting is inefficient at penetrating the water below 12 inches in most cases and does not evenly light the aquarium. It causes excessive heat and warms the water above the temperature you have the heater set to maintain then allows the water to cool when the lighting is turned off. Incandescent lighting is very expensive to operate as compared to fluorescent and LED lighting. Incandescent lighting bulbs have a very short lifespan, and can even brake if splashed with water while turned on. Another type of available lighting for aquariums is fluorescent and compact fluorescent lighting. If a fluorescent lighting fixture is used, replace the bulbs with bulbs specifically rated for aquarium plant growth. The spectrum needed for plant growth is entirely different than a fluorescent bulb one would find in the kitchen or office lighting. Do not use fluorescent light bulbs from a hardware store; they may fit within the fixture, but they are not ideal for growing aquarium plants. The cost to operate most common LED lighting fixtures is less than 10% of the cost to operate the average Incandescent lighting fixtures, and less than 30% of the cost to operate most fluorescent aquarium lighting fixtures. Specialty lighting can be fun for effect within a community aquarium. One type of LED lighting for aquariums comes in a water-proof glass tube which allows it to be placed underwater, anchored by suction cups and behind plants. This can give a mysterious glowing effect to viewers, casting unusual rays of light coming out from behind plants and rock features. Another specialty light available to aquarium hobbyists is a spotlight effect. Some are used above the surface to highlight one plant or piece of décor. Other types of “spot” effect lights can be anchored underwater shining up at a plant or feature creating interesting effects. With the constant innovations coming from LED lighting, comes a remote-controlled version that allows an infinite variety of colors and intensities. Commonly available within standard LED lighting fixtures made for aquariums is a “moonlight.” These lights are used in the “night time” cycle and allow the hobbyist to view fish behavior in the dark. The wavelength that creates the blue color can be seen by humans but does not interfere with fish sleep cycles or nocturnal activities of the catfish cleaning crew, shrimp, and other things that come out in the night. It is advisable to use a timer to turn lights on at a set time and off at a set time every day. Consistency is necessary for best plant growth and for fish to develop a regular life cycle. Can you leave lights on 24 hours a day without killing your fish? Yes. Is it advisable or even humane? No! Setting the lighting to be on at least 8 hours to 12 hours per day is best, depending on the home schedule of the viewers. The community aquarium is there for your viewing enjoyment, so set the light cycle to be on when observers are more apt to be in the room. Is it okay to turn on the lights if a visitor comes at an odd hour and wants to see the community aquarium in all its lighted glory? Yes, it is okay occasionally, but remember; it will take 20-30 minutes for the fish to fully “wake up” and become as active as they are in a normal light cycle. It is important to remember: a well-run community aquarium simulates nature as closely as possible. In nature, the sun comes up every day and goes down every day, and the sun does not come on in the middle of the night. Remember this when deciding to turn on the aquarium light out of cycle. It is okay sometimes, but it is not natural to your fish and their life. If the roots get too hot as compared to the water temperature. This could happen if the aquarium is over a floor heating register. It is never advisable to have an aquarium near or over a room's heating source. When the roots are too hot as compared to the plant itself, the plant can turn yellow and die. A light source that is too weak in intensity for proper aquatic plant growth (old-fashioned screw-in bulbs for instance). Or the tank itself is too deep for the lighting fixture you have chosen; make sure to tell your dealer what size aquarium the lighting fixture is for. Different intensities are available for different deaths of the aquarium tank. The aquarium water pH is too acid. True aquatic plants were allowed to dry out before planting in the aquarium. Too many plants in the aquarium, and the foliage at the bottom of the aquarium is being shaded from the growth generating light by the plants above it. Remember that plants with red or reddish color require special lighting and fertilizer to thrive. Avoid these as a beginner. Refer to the list of suggested plants for the community aquarium listed below. The aquarium is not yet established, so there is not enough “fertilizer” from the fish built up yet. This can be remedied by commercially available aquarium plant food in liquid or tablet form. This list makes no attempt to be complete or to go into the various species of each plant suggested. Some have roots, some have bulbs and others are bunch plants. What the plants on this list do have in common is they are all easy to grow and pleasing to the eye! 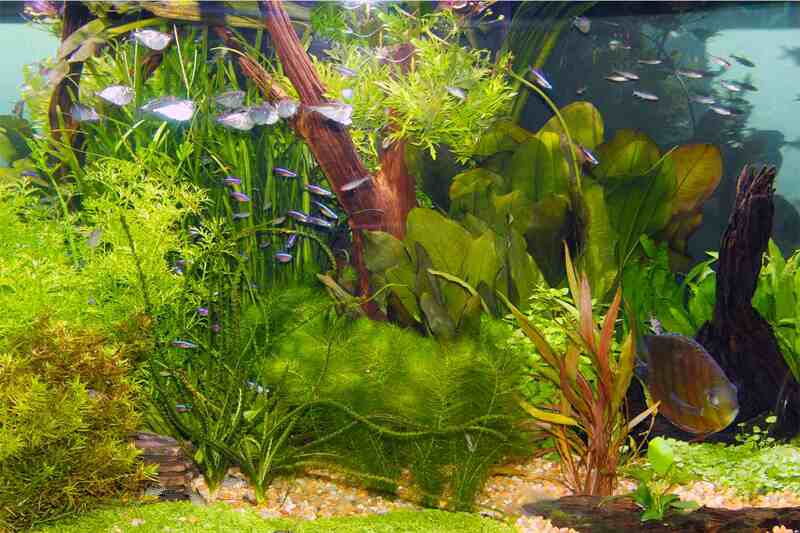 Aquarium plants can become a major part of the hobbies for many hobbyists; there are societies for aquarium plant fanciers as well as books and websites that specialize in aquarium plants as well.